We quickly fell into a routine, waking up with no alarms before walking around the island to breakfast each morning. We ate so much food every morning, the buffet was incredible. We normally started with fruit prepared by the fruit chef, followed by eggs, waffles and smoked salmon from the egg and waffle chef, there was a patisserie section with pastries and muffins, cooked breakfast, cereals, juices and even curry! We filled ourselves up so we didn't need any lunch and sat each morning overlooking the water watching the friendly sharks and sting-rays swim past. We visited the dive centre on our first day and collected our snorkels and fins for the week and then everyday we would snorkel around the island for about 2 hours, you lose track of time under water! The dive centre were amazing and told us the best places to look for turtles, there are 12 living on the reef and if you take a photo they can identify them and tell you their names. We saw 4 different ones. There were also black tip reef sharks and hundreds of different types of fish. My photos don't do the colours justice. If we were braver we would have dived when we were out there but just stuck to snorkelling. 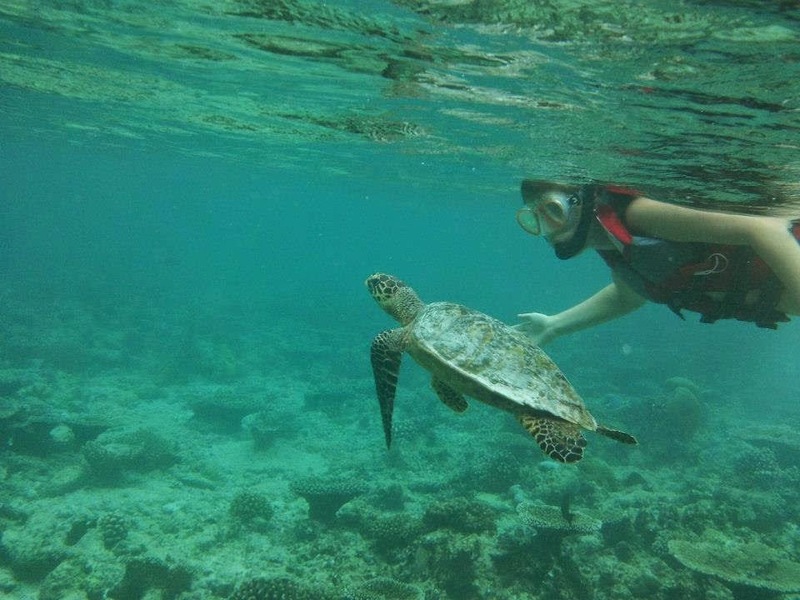 We got so close to the marine life, it's a whole other world under the sea! It was scary to see sharks at first even though they're not at all interested in humans. We usually spent the morning on the beach, alternating between lying in the sun, swimming and then reading under the palm trees. The sea was so warm and clear. The hotel has just finished an infinity pool last month which is open now but we actually didn't miss a pool when we were there, the sea was so much better. I loved these waiters who came around periodically offering refreshing fruit skewers and cold towels. In the afternoons we wandered around the island to a different part of the beach, we lived in swimwear the whole time apart from getting dressed for dinner in the evening. The old saying about not needing shoes couldn't be more true 'no shoes, no news'. We both read lots of books and just lazed around, Ben said he was in heaven watching cricket with a view of the sea. I was in heaven with my kindle and the sunshine! One afternoon we visited the spa for a couples massage, which again was h e a v e n l y. Such an indulgent week, just what we needed after the wedding. Every evening, we'd get ready for dinner and watch the sunset. In the middle of the week we went on a sunset cruise, I love boats so it was relaxing to go in the middle of the ocean, bobbing around watching the sky change colours and the sun gradually hitting the water. It was fun dressing up every evening and making a special effort for dinner. We normally do some self-catering when we're on a normal holiday but I'm glad there was no kitchen in our villa as the food in all of the restaurants was amazing. As honeymooners, we got thrown a candlelit dinner on the beach one evening with lots of fresh fish and a chocolate heart shaped dessert. Or the light house bar which was my favourite, looking down over the sea. We ate so much fish when we were out there, it's all so fresh as a large percentage of the world's fish industry is from the Maldives. We both love sushi. It was so nice to sit by the water outside every evening, the nights were so warm. The Lighthouse restaurant has more of a fine dining approach compared to Lime or Cayenne the other two restaurants but we loved all the food for the whole week. We loved the tepanyakki restaurant too, so theatrical. Every night after dinner we'd walk back to our villa along the beach, it was lit only by the stars and moonlight. So magical I think we'll remember that week forever. Holidays in the future have a lot to live up to after Baros, we were so sad to leave! Coming back to see our wedding photos and videos softened the blow a little though! And as I said in this post, the UK had a heatwave the week we got back. I hope we can return to The Maldives in the not too distant future! !